Running a 26.2 mile marathon is a fulfilling experience for anyone. Doing so on the first anniversary of your breast cancer diagnosis makes it even more special. When 40-year old Kim Loving of St. Augustine, Florida learned she had estrogen positive HER-2 breast cancer on February 15, 2008, she realized she didn't have time to wallow in self pity, especially with a family including three children to care for. She had no family history of the disease. She ate well, exercised regularly and didn't smoke. Yet she became one of the more than 182,000 women in the U.S. diagnosed with invasive breast cancer in 2008. After undergoing a mastectomy at another hospital, Kim came to Mayo Clinic in Jacksonville for a second opinion after chemotherapy was recommended. Dr. Alvaro Moreno Aspitia, her oncologist at the Mayo Clinic Breast Center, recommended a treatment plan that included six cycles of Taxotere and Carboplatin followed by a year of Herceptin, a targeted therapy for her specific type of breast cancer. Throughtout her chemo treatment, Kim made herself get up and regularly walk or run, even when she didn't feel up to it. It was the only thing that made her feel better and have a sense of normalcy. An avid runner, she started running with some women in her neighborhood and set a goal of participating in the half-marathon segment of the 26.2 with Donna: The National Marathon to Fight Breast Cancer in Jacksonville -- which coincidentally was held on February 15, 2009 -- the one year anniversary of her breast cancer diagnosis. 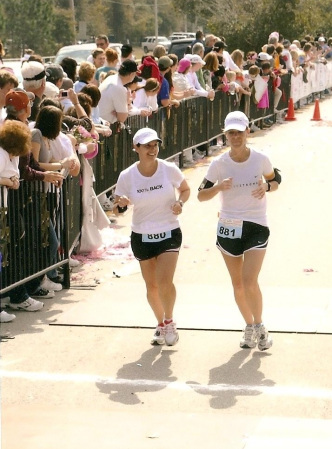 When Kim realized the significance of the date, she decided to run the full marathon instead of the half marathon, even though she had only done so once before 12 years ago. Kim's training and dedication to achieving her goal paid off. She ran the entire 26.2 mile marathon in 4:47 (4 hours, 47 minutes), an accomplishment by anyone's standard. "I wanted to do this for my family and for all the other women facing a breast cancer diagnosis," said Kim. "I wanted to run the full marathon so that I could show others going through treatment that there will be a day when they feel normal again and that life goes on."